Delaware’s lone Amish community is experiencing a whooping cough outbreak, at least the third significant occurrence in the community in the last 30 years. This Delaware Online article reports that eighty percent of the four dozen cases are in children under the age of eleven. 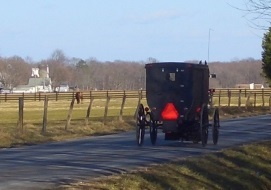 The outbreak has so far been restricted to the Amish community, located west of state capital Dover. Whooping cough, also known as pertussis, evolves into a series of coughing fits that lasts for weeks. It is known for the “whooping” sound that results when patients have violent and rapid coughing until the air is gone from their lungs and they are forced to take a loud inhale. Babies who are too young to have been vaccinated face risks of life-threatening pauses in breathing called apnea, according to the Centers for Disease Control and Prevention. The disease spreads through coughing and sneezing while in close contact with others and generally is treated with antibiotics. Early treatment is important. The Delaware Amish have had a history with whooping cough. Nine years ago this settlement experienced a much larger outbreak of over 300 cases. A little online searching reveals that the community also experienced a large outbreak in 1986. When obscure (or supposedly obscure) illnesses strike Amish communities, the public naturally wonders about vaccination and medical care among the Amish. As in previous outbreaks, the Dover community is cooperating with efforts to control the disease, with an Amish home being used for vaccinations, medicine and education. For various reasons, Amish populations are generally less vaccinated than the general population. in 4 weeks so should we not go because of this health outbreak? From my map, it looks like Sugar Creek,OH is some 7 hours (428 miles) from where Dover, Deleware. I would not worry about it. I know that since my kids were immunized years ago, they’ve discovered that not all the vaccines have as long a lifespan as they’d originally thought. So both my kids had to be re-immunized for chicken pox and whooping cough. That may be one reason for the outbreak; we once thought that immunizations in early childhood for some of these diseases would cause lifetime immunity, but unfortunately, that’s not always true. I hope they’re able to get this outbreak stopped before any child dies! is this outbreak only on children or both grow ups? Guy, there is more info in the article I linked, but mainly children are affected. This is occurring in Delaware in a community which is distant from and not really closely tied to the Ohio community you mentioned above. Also, chances are you are vaccinated, though generally speaking on vaccinations, you may want to check your history, and also look into further sources of info on whooping cough if you have a concern. My husband and I are both Senior Citizens and have been immunized against whooping cough. But, about 8 years ago, I came down with a verified diagnosis of whooping cough. It took about 8 weeks to get rid of. In the meantime, my husband also came down with the whooping cough. The VA didn’t treat his as aggressively as my doctor did and he ended up giving it back to me. We were down for about 3 months before we were cleared. It’s not fun to have. Whooping cough has been back for 3+ years. It can hit anyone. While a young to middle aged adult can probably go through it with no residual they can carry it to infants, (you may find that new parents won’t let you anywhere near the baby if you have not been immunized) the elderly, or people whose immune systems are not strong enough to fight it off. The CDC originally sent out a directive that if a person had not been immunized for Tetanus within two years they should be given a Tdap, within 4 months or so they sent out another directive to just shoot whoever we could get our hands on with Tdap. This stuff can be very serious and it can move very fast. One of our patients came in on a Friday with symptoms of an upper respiritory infection and I x-rayed her. There were some findings on the left so the doctor put her on antibiotics and sent her home as she wasn’t feeling all that bad. Monday she was back and very ill. I took another chest x-ray and both lungs were involved. She ended up in ICU for two weeks. The Tdap vaccine is readily available and covers tetanus, diphtheria (something else you don’t want) and pertussis. Most adults neglect their immunizations and may not be covered for any of these. And, as another poster mentioned, we find out as we go along that the vaccines may not be good for life as we first thought, or a new strain of a disease appears and a new vaccine is created and distributed. Because if the tetanus included this is a shot that will make you feel like you have a charlie horse in your arm if you get the combo but the individual vaccine is available too. I had to have a tetanus shot year before last & I was advised then to get the combination vaccine which I did… however, that did not prevent me from having a really nasty case of Whooping Cough that I had to fight all of this summer. The effects of it have lasted for the last 8 months and only really went away with a treatment of predisone and an inhailer after regular antibiotics didnt touch it. I still use the inhailer sometimes today.. It was a really nasty bug and Im a healthy 52 year old.. I pray these folks find relief from the Whooping Cough. I myself was vaccinated for whopping cough as a young child, but still managed to contract a different strand of the virus when I was 15. It was horrible to get & it lasted in total for about 9 months. I pray these people recover quickly. One thing I’ve learned by reading these stories is that whooping cough sounds pretty nasty. Thanks to everyone who’s shared. I guess this brings home the point that being up on your vaccinations is a good idea. I “ran into” whooping cough once in northern Indiana when selling books, though I only spoke to the mother of the afflicted child. She asked me if I was vaccinated, and I didn’t know what to tell her. Yesterday, when I read this, I was going to post that tuberculosis is making a resurgence, too. Due to the fact that several years ago there was a series of stories on the news about this (with a correlation made that suggested that immigrants were the source of at least some, if not most, of the resurgence of that dreaded disease)and there was a big fuss over it, I discounted the idea. There was so much backlash at the time against these stories from the pro-immigration (legal OR illegal) crowd that the whole matter was sort of just swept under the rug. Anyway, we can be PC and sweep matters like that under the rug and not talk about it if we wish, but it doesn’t stop a disease from increasing it is going to do so. Apparently that is the case with TB, as there was story on the news this morning about a high school where there are 17 cases of active TB being treated right now. I walked into the room as the story was airing, but missed where the high school is located. This caused me to change my mind and go ahead and post this; PC Nazi’s not withstanding. For the record I am VERY pro-immigration; LEGAL immigration that is. Throwing open the borders and letting people of all sorts pour in as they wish … well, not so much. Anyway, it is worth keeping an eye on this situation with TB regardless of your view point on immigration. Old Kat, my husband and my first house in Chicago was just a few short blocks from a former Tuberculosis sanatorium (remember those?). It had been converted to a nursing home. I certainly remember the mobile units (like large buses) that would park in local shopping areas, where you could get chest xrays to see if you HAD tuberculosis. If so, you might end up in a sanatorium (a friend’s older sister did). I had whooping cough as a child, and was hospitalized with it. (Also was hospitalized with pneumonia.) I thank God I made it this far! I had a flu shot, Tdap & shingles vaccine last Fall, before a planned surgery. Then, while hospitalized after surgery, they asked if I wanted a pneumonia vaccine. I told them i had one in my mid 50’s, and they said that the one they give to people 60 and over (me) is different than the one I’d gotten earlier, so I figured I’d get it. No problems with ny of them. I’ve had a couple of minor colds since then, but nothing worse than that. Whooping cough was rampant in or county over the past couple of years. I’m glad both of my granddaughters are old enough for the vaccine. My schoolteacher daughter needs to be up to date with her own vaccines, as kids she teaches tend to be carriers of all kinds of nasty “bugs”, which then come home with her. If it weren’t for antibiotics & vaccines, I’m certain I wouldn’t be here today!